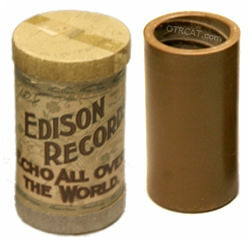 "Vess Ossman Yankee Doodle 1897"
Wax Cylinders were the first commercially produced sound recording devices and offer an early look at turn of the century audio technology as well as popular music and culture from the late 19th century and early 20th century. Mass recording were made on Wax Cylinders from music to speeches to comedy routines all to be enjoyed the in comfort of the listener's home. Emil Berliner (1851-1939) – Early developer and inventor of audio technology including the Gramophone, Emil Berliner recorded "Twinkle, Twinkle Little Star" in 1887. Thomas Edison (1847-1931) – One of the most prolific inventors in history holding over 1,000 patents (including the phonograph), Thomas Edison recorded Mary had a Little Lamb and also experimented with early music recordings. US Marine Band – One of the oldest profession musical organizations, created in 1798to perform for the President of the United States nicknamed "The President's Own." Vess Ossman (1868-1923) – Popular banjo player, Vess Ossman was a popular recording artist mass producing music from cakewalks and rag time parties. Arthur Collins (1864-1933) – Early recording star known for Dixieland singing and some popular Mistral-themed songs, Arthur Collins recorded such music as "Hello! Ma Baby", "Zizzy Ze Zum Zum", and "Happy Days in Dixie." Russell Hunting (1865-?) – Early comedian recording artist, Edison used Russell Hunting for their Michael Casey comedy skits. Ada Jones – Early recording star, Ada Jones was known for performing with different accents and impersonations. Be the first to comment on "Wax Cylinders 1 (1880 1890s)"